Click this button for the full staff list or scroll down to see each member. Steven is Clinic Director and co-owner of Renew Star Serpentine Ltd. He graduated from the University of Southampton, UK in 2000 with a BSc Hons in Physiotherapy. After graduating, Steven worked in the UK both privately and within the National Health Service (NHS) before moving to Trinidad in 2003. Working in the NHS allowed Steven to develop an extensive knowledge base and utilise a broad range of clinic skills. On moving to Trinidad, Steven set up Serpentine Road Physiotherapy Clinic, which later merged to form Renew Star Serpentine Ltd. in early 2009. Steven enjoys treating musculoskeletal injuries and has a keen interest in sports injuries. Steven’s aim is to provide a first class, all-inclusive rehabilitation clinic and he is committed to improving the level of Physiotherapy care in Trinidad and Tobago. Steven is a member of the UK-based CSP (Chartered Society of Physiotherapy), ACPSM (the Association of Physiotherapy and Sports Medicine) and PATT (Physiotherapy Association of Trinidad and Tobago). Kristi Maingot attended the University of North Carolina at Chapelhill where she received a Bachelor of Science degree in Biology in 1999. She continued her education at University of St. Augustine for Health Sciences in St. Augustine Florida, where she received a Masters and Doctorate degree in Clinical Physical Therapy, as well as a Manual Therapy Certification in 2001. Following graduation she worked in Florida for 5 years, as a staff therapist and then was promoted to Clinical Director with CORA Rehabilitation. She returned to Trinidad 6 years ago and is currently a member of the Trinidad and Tobago Physiotherapy Association as well as the Florida Board of Physical Therapists. Following her dream of starting a comprehensive, first class rehabilitation clinic in Trinidad, she opened Renew Star Serpentine Limited in January 2010. She is currently following other dreams of expanding the public’s knowledge of the benefits of Rehabilitation, in order to reach all those who deserve to live a life free of pain and limitation. Devin Santos was born in Trinidad and Tobago, and attended St John’s University, Minnesota, where he completed a BA degree in Nutrition, with supporting courses in the major sciences and sports medicine in 2008. Following this, Devin completed his MSc in Physiotherapy at Glasgow Caledonian University, Scotland. During this time he completed 8 months of practical placements at numerous medical establishments with concentrations in several different specializations throughout physiotherapy. These specializations included in/out-patient care, palliative care, community health care, elderly healthcare, respiratory care, and stroke rehabilitation. Devin became registered to practice physiotherapy in Trinidad and Tobago in April 2012. Blayne grew up with a passion for helping others, volunteering his time at Living Waters Church and St. Finbars Geriatric Home, amongst others. After finishing high school, Blayne attended Oxford Brookes University where he obtained a Bachelors (BSc) in Physiotherapy. He worked in various establishments in the United Kingdom, gaining experience in spinal rehabilitation, orthopedic care, and musculoskeletal in/out-patient settings. Blayne continued his education completing courses in Myofascial Release, Movement Mechanics and Muscle Activation, Cervical pain and thoracic outlet syndrome; to name a few. He has a love for exercise and hobbies include gym, squash, and motorbike racing. Aqiyla Gomez is a licensed Physical Therapist in Trinidad and Tobago. Aqiyla attended North Carolina Central University, North Carolina, where she completed a B.Sc. degree in Exercise and Sports Science. Aqiyla later attended Nova Southeastern University (NSU), Florida, where she successfully completed her Doctorate degree in Physical Therapy. Whilst at NSU, Aqiyla completed 10 months of full-time clinical internships at various clinical settings including Acute-Care, Skilled Nursing, Outpatient Sports and Outpatient Neurological Rehab. Aqiyla worked with an array of patient populations including athletes (professional, collegiate, high school, recreational), geriatric, musculoskeletal and neurological. Being a past varsity athlete herself, Aqiyla enjoys treating patients with sports/ musculoskeletal injuries, but also has a great interest in neurological physical therapy. Sheila is a fully qualified Physical Therapy Assistant with a license to practice in Maryland, The District of Columbia, and Virgina. With eight years’ experience both in the US and in Trinidad, Sheila has also volunteered with the International Red Cross in West Africa. Working in the Maryland Public School System afforded Sheila the opportunity to work with children with cerebral palsy, spina bifida and other childhood aliments. Sheila has found her calling in therapy, as she thoroughly enjoys working and volunteering to better her patients’ lives. Dr. Gopeesingh is a Sports and Exercise Physician. He completed his medical degree from the University of the West Indies, Mt. Hope and graduated with a Bachelor of Medicine and Bachelor of Surgery in 2000. Following this, he successfully read for a Master of Science in Sports and Exercise Medicine at the University of Nottingham, UK in 2004. He was then successfully awarded entrance as a Member of the Faculty of Sports and Exercise Medicine, a joint faculty of the Royal College of Surgeons of Edinburgh and Royal College of Physicians of Edinburgh in 2006. Dr. Gopeesingh has, and continues to, serve many national federations in Trinidad and Tobago, inclusive of Track and Field, Cricket, Volleyball, Hockey, Football, Netball and Karate. He also continues to work with the Trinidad and Tobago Olympic Committee. In this capacity, he has served as Team Physician to the CAC games, Pan-Am Games, Commonwealth Games, Olympic Games, World Championships in Track and Field and many other regional meets. His passion for treating athletes continues to be his main drive and, as a physician treating many elite athletes, to understand the importance of a team approach to the successful management of injuries. A sports and exercise physician plays an integral role in ensuring an accurate diagnosis. To this end, Dr. Gopeesingh utilizes diagnostic dynamic ultrasound imaging to increase diagnostic accuracy. Following this, he creates a well structured plan specifically tailored to that particular injured region and injury. This, of course, will reduce time off from injury and allow the athlete to return to True Potential. Shivani qualified as an Occupational Therapist in April 2014, and holds a Masters in Occupational Therapy from Sheffield Hallam University in the United Kingdom and a Bachelors in Human Kinetics from the University of Guelph in Canada. Throughout her education, Shivani has obtained experience with older adult dementia, paediatric rheumatology, visually impaired older adults, and neuroscience. Shivani currently practices at Therapy Works Ltd (a paediatric outpatient clinic), as well as Renew Star Serpentine Ltd. Shivani enjoys working in both areas of practice where she can learn from as well as assist as many individuals as possible, hoping she can contribute towards society by serving her country in the development of Occupational Therapy. Stephanie Llanos graduated in 2011 with a Master in Sciences, Occupational Therapy from Florida International University, with honours. After obtaining her Florida state license, she began practicing full time at Heartland of Kendall, a skilled nursing facility, and part time at West Gables Rehabilitation. Both are located in South Miami. Stephanie has a true passion for her profession. She has become very involved in advocacy efforts for Occupational Therapy, not only locally, but within the region. Her initiative to assist in the growth of her chosen profession range from frequently presenting at local conferences, to being the former Public Relations Officer of the Trinidad and Tobago Occupational Therapy Association. She has served two terms and has been elected to Vice President of the Association of Caribbean Occupational Therapists (ACOT). She will be accepting Presidency of ACOT in 2017. Her favoured areas of practice include but are not limited to orthopedics, hand rehabilitation, ergonomic assessment, home modifications and splinting. 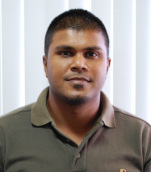 Amir has been a Massage Therapist since 1997 and worked in sports therapy and rehabilitation from 2002 to 2009. At Renew, he specializes in Deep Tissue Medical Massage and Sports Massage. Amir is currently the President of the Massage Therapy Association of Trinidad & Tobago and is a fitness enthusiast himself. His philosophy is to try to leave something better off than the way it was found and to “Live, Love and Laugh”.